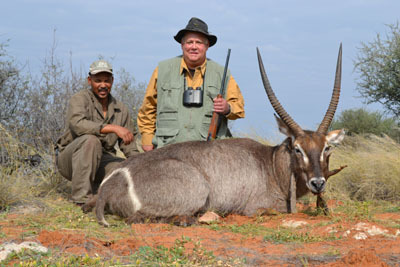 Ever since I have been hunting Plains Game in Southern Africa I have always wanted to shoot a Waterbok. 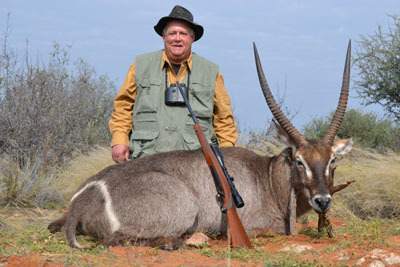 Not all hunting venues offer Waterbok and they are quite pricey. In 2011 my friend Jan guarenteed me a Waterbok for a good price because I was a returning customer and friend. 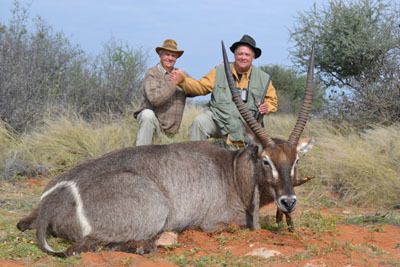 While dining on Gemsbok steak and Kalahari truffles one evening in May 2011, Jan and I discussed the Waterbok hunt. He said that the Waterbok on his ranch had been hunted heavily and I would go to a nearby farm in the Dordabis Conservancy to hunt the Waterbok. The Dordabis Conservancy is a group of farms that share the hunters with one another. The Dordabis Conservancy offers 400,000 acres to hunt on. Johannes, Jan's main Professional Hunter, and I went to the other farm and met Gert. Gert had a lot of rain and water on his farm in 2011 and some of the area was inaccesible. We found a really good Springbok and I shot it with one shot; the first animal I had shot in 2011. I felt good after that. It was a confidence builder. We also saw a good Blue Wildebeest and I shot that also. It took three shots to down the Wildebeest. Gold. We were still after Waterbok. We saw a Waterbok Bull. Johannes and I took off after the bull. Gert saw our every movement during the stalk. We got close to the bull and then it spotted us. It ran off. Gert saw the whole thing. He said we got close for a shot and then the bull took off. We went back to Jan's farm. Over a meal of Blue Wildebeest cutlets Jan and I discussed the day's events. He said "No Waterbok, no good." Also he was not happy that I had shot a Blue Wildebeest when he had specifically told Gert that we were after Waterbok. The next day Jan would lead the Waterbok expedition to another farm in the Dordabis Conservancy. Jan had a deal with the owner there to harvest a Waterbok for me. We drove to the other farm and met Big Aron, the manager. Aron, Jan, Franz, and I got in the bakkie and went into the thornbush covered veldt. We saw many female Waterbok but no bulls. We went to a different part of the farm and saw some small bulls. All of a sudden we saw a magnificent Bull Waterbok. I took a shot and I thought I hit it squarely. The Bull ran off. A blood trail was followed and the Bull had run about 50 yards. It was down. With one shot through the heart. I was overjoyed!! My first Waterbok!! It was Gold!! I don't know but I must say that is one large animal because it would take three of you to make one of him!